Wilma Ramos was born in 1940 in Mogi das Cruzes, Sao Paulo, Brazil. 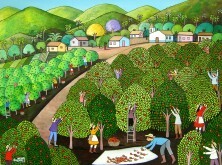 Having lived in Sao Paulo, she began her artistic career in 1967. She died in 2009.